Belmont Park brings fun, sunshine, and beachfront views to both visitors and employees every day! If you are an energetic, friendly, and self-motivated individual that enjoys a dynamic work place, this is the place for you. At Belmont Park, we pride ourselves on our diversity and welcoming environment. Whether you are just starting your career or come with experience, there is always a place for great talent. 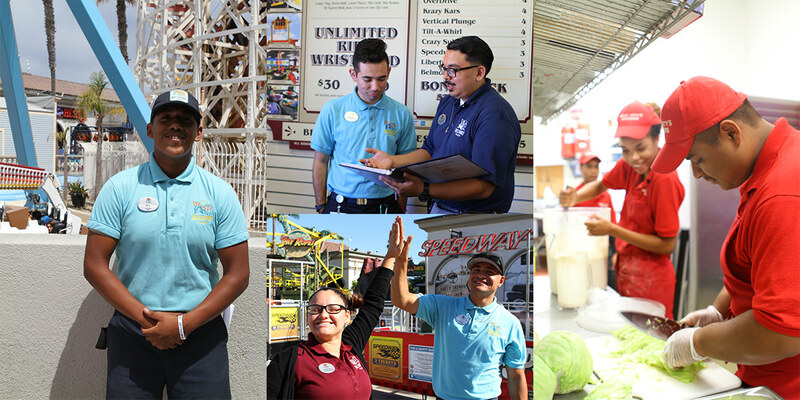 Belmont Park offers many roles including food service, ride operations, retail, maintenance, security, and management. There are many opportunities for growth and many benefits of working at Belmont Park. As a ride operator, you receive on the job training to safely operate and provide service at our rides for all of our guests. Help create a fun and safe environment every day! As a food service member, you will learn how to prep and serve delicious food at our many food locations which include Hot Dog on a Stick, Belmonty’s, Sweet Shoppe, Dole Whip, Beach Treats and Dippin Dots! Where is the best place to apply? The best place to apply is jobs.belmontpark.com. We have paper applications available at the park. You may pick up a paper application the main ticket office. No. You may apply for as many jobs as you would like. The online application will allow you to choose several positions. If your desired position is not listed, it is most likely not currently an open position. You may always call us to inquire about open positions available. I have a resume; do I still need to fill out an application? You will get a call from us once we review your application. We look at applications on a first come, first serve basis. If you don’t hear anything from us within a week, please contact us to follow up. You may contact us at HR@belmontpark.com or (858) 488-1549. How old do I have to be to work at Belmont Park? You must be 16 to work at the park. All minors (under 18) are required to have a valid work permit prior to the start of employment. individual interview. You will be asked about your job or school experience to get to know you better. We are looking for enthusiastic, guest-oriented individuals so just be yourself! The purpose of the interview is to ensure this is the right fit for both you and Belmont Park! What are the HR office hours? There is no designated parking for employees or applicants. Please park in any of the free public lots surrounding the park. Parking gets filled quickly during our busy seasons (Summer and Spring Break) and on weekends. We recommend you give yourself plenty of time before your shifts and/or interview. When do you start hiring at Belmont Park? Typically, hiring begins in early February/March and will continue throughout the summer. Belmont Park is open year-round with reduced hours in the winter and fall. Hours are extended beginning Spring Break through the summer. Please see our Calendar for more information about Belmont Park’s operating schedule. The best time to apply is between January and May when we do most of our hiring and training in preparation for a busy spring break and summer. However, since we are open year-round, we do hire year-round. Please see the open positions on our career page on our website or simply apply and give us a call! What are the employee benefits for full time staff? We offer medical, dental, vision and life insurance. We also provide generous paid time off and paid holidays. Are there employee perks for part time employees too? employees receive this benefit. We also have fun events throughout the year! As a representative of our company, we require employees to maintain a professional, neat, clean and well-groomed appearance. All employees must choose hairstyles and colors that are conservative and not extreme or distracting in color or style. Hair color must be a “natural” hair color or may be dyed a naturally occurring hair color. Beards, mustaches and goatees are allowed; however, they must be neatly trimmed and not longer than a quarter of an inch. Other than established beards, mustaches and goatees, you are expected to be clean shaven every work day. An established beard must not have any empty spaces between the sideburns, mustache or goatee. Please select tasteful and appropriate jewelry to wear at work. Remember that jewelry should be both safe and appropriate for your work environment; no extremes are allowed. Food Service employees must comply with Department of Health regulations. Consult your Supervisor or Manager if in doubt. Tattoos are not permitted if visible when wearing a company-issued uniform or when wearing business or professional dress. You may not cover tattoos on your hands or head with bandages or makeup however you may cover them with a sleeve. Which documents are acceptable to prove employment eligibility on the I-9 form?